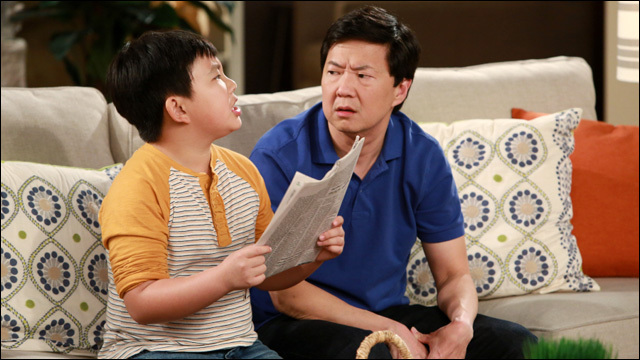 This week on ABC's Dr. Ken, Ken's got hoop dreams for Dave, who couldn't care less about basketball -- he'd rather go to a city council meeting than play in a game -- much to his father's dismay. Ken continues to push basketball (his passion sport) on Dave, but his son is more interested in going to a city council meeting about the extreme drought in California rather than playing in a game. Meanwhile, Damona tries to work the system at the office to get more vacation days; and Molly tries to convince her mom to let her wear a skimpy outfit. Guest cast: Thai Douglas as Coach 1, Jack Impellizzeri as Coach 2. "Ken Cries Foul" was written by Mike Sikowitz and directed by Rob Schiller. Executive producers are Mike Sikowitz, John Davis and John Fox. Ken Jeong and Mike O'Connell are co-executive producers. "Dr. Ken" is produced by Sony Pictures Television and ABC Studios.